Quick update on Faith. She's doing great!! Had her first mini-event this weekend. She schooled Beg. 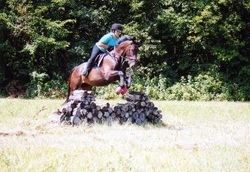 Novice and some Novice jumps also and never looked at or refused any, except for the ditch. She thinks it's the black hole, she leaps over it like it's 50ft. long. It's sort of funny. Anyways she placed second out of seven in Baby Beg. Novice. We will move her up to Beg. novice next show. Quick note to say Faith is doing very well! 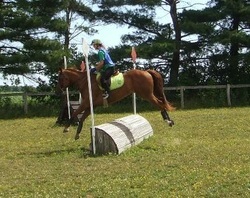 Solid Novice, jumps everything we put at her. Mel and her are a great pair, she's an awesome mare! 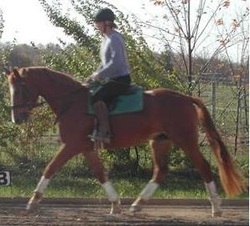 did a walk trot class and got a 70%!! She is such a peach. this season. 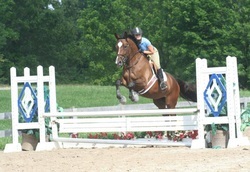 She got a 73% after this ride [picture]!! Yeah! She has really started to develop into quite a young lady. I'll send more bragging later. Ha ha Thanks so much for such a great horse. Meri is working on the jumping and she went to a Greg Best clinic and he loved her and started calling her princess....ugh! recommended her highly to all of my clients." nationally for Hanoverians and top 7 at Second Level. of trust and highly ethical. I recommend Amanda to fellow horsemen at every opportunity." extraordinary teaching ability have enabled Billy and me to dream bigger than we ever anticipated and to be successful at every level! 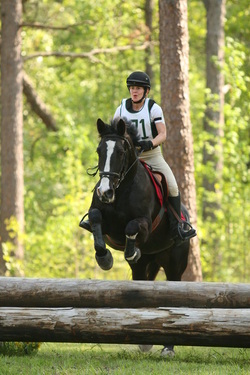 I work with her on all three phases of eventing - dressage, stadium jumping, and cross country - and she is an excellent trainer of every discipline. I have upmost faith and trust in Amanda and look forward to future successes with her." division. It went pretty well. It was so fun to watch him go! I have been doing some schooling shows with him and it has been pretty fun. 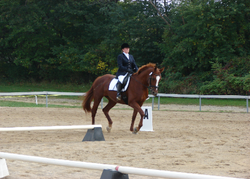 The last schooling I went to I got a 29.5 on my dressage test! I was pretty excited. will have to send you a picture from her next show. importantly, she has been a sensitive instructor for me and my horse, willing to invest time and energy to help us reach our full potential."